The Cherry Red Records Combined Counties Football League is a regional English football league currently comprising teams from the south-western quarter of Greater London and Surrey, and acts as a choice for teams that achieve promotion from the top Berkshire and north Hampshire-specific league. It has two non-reserve divisions and its top division sits at Step 5 of the National League System (or Level 9 of the overall English football league system). The league was formed on 18 June 1978 when the Surrey Senior League underwent a metamorphosis in order to try to attract clubs from outside the county. The new league was initially called the Home Counties League but there was an objection to the title from the Home Counties Conference so, in 1979, it adopted the current title. For the 1981–82 season the league had too many clubs to operate a standard league season so the clubs were split into two equal divisions, Eastern and Western, with Ash United from the Western division beating the Eastern champions Malden Town 3–0 after a two-legged play-off. The league was accepted as a feeder to the Isthmian League and, since FA restructuring of the National League System, clubs can be promoted to the Southern League, subject to geographical restrictions. Between 1982 and 2003 the league was half of its present size so an additional league existed below (the Surrey Premier League which became the Surrey County Senior League). Replicating football league terminology nationally, the existing teams in 2003 became an upper division (Premier Division) and the newly admitted teams from the abolished league became the lower (Division One). Its rules allow up to three teams to be promoted and relegated between the two divisions; promotion is dependent on the clubs finishing in the top three of Division One having the correct ground-grading. Division One is "fed" by the leagues at Step 7 of the National League System such as the Surrey Elite Intermediate League, the Middlesex County League and the Thames Valley Football League. The League organises three cups. The Premier Challenge Cup is competed for by the teams in both divisions. The current holders are Farnham Town. The Division One cup is held by Worcester Park. The League organises the Grant McLellan Youth Cup for current and ex-member clubs who have teams playing in the under 18 age group in other leagues. The current holders are Bedfont Sports Under 18s. 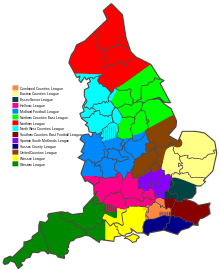 The area covered by the Combined Counties League is coloured in peach. The league has had a succession of title sponsors. Currently Cherry Red Records are the League and Premier Challenge Cup sponsors. Their RPM Records offshoot sponsors the Division One Challenge Cup. For the 1978–79 season the league was known as the Home Counties League. For the 1981–82 season the league expanded to two divisions. For the 1982–83 season the league reverted to a single division. For the 2003–04 season Division One was added formed mainly of clubs from the Surrey County Senior League. ↑ California, England is part of Finchampstead. The team play at Eversley. ↑ "The History of the League". Combined Counties Football League.